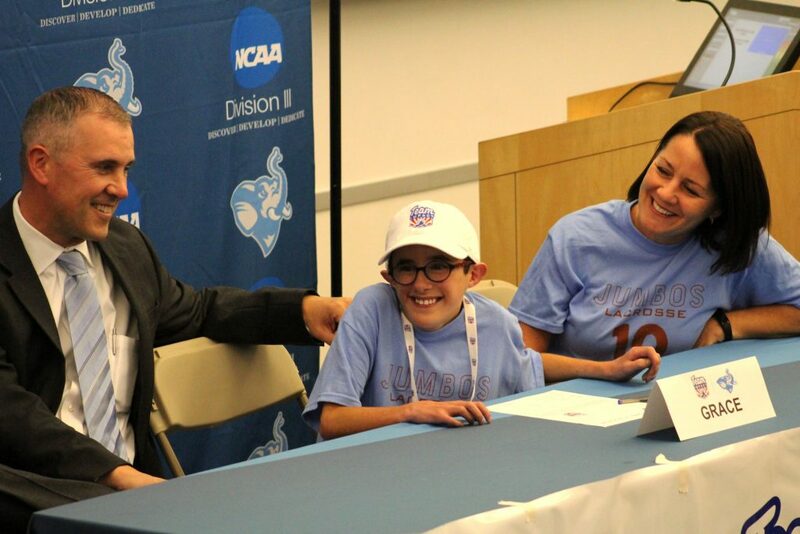 The Tufts women’s lacrosse team formally welcomed Grace Zinck, a 14 year old from Melrose, Mass., onto their team in an honorary draft ceremony on Sept. 28. Zinck was paired with the team through the non-profit organization Team IMPACT, which connects kids with acute or chronic illnesses with collegiate sports teams. While Tufts has been involved with Team IMPACT for eight years, this is the first time that the women’s lacrosse team is involved with the program. Posters with the words “Grace No. 10” adorned the walls of the Steve Tisch Sports and Fitness Center to celebrate Zinck’s draft day, where Zinck officially began her two-year commitment to the women’s lacrosse team. The team arrived early to help set up the venue on the third floor of the fitness center and, in anticipation of Zinck’s arrival, the space became packed with student athletes, family members and community members. When Zinck entered the room, the crowd erupted in applause. Zinck sat between her parents in front of an official NCAA backdrop and listened as members of the women’s lacrosse team voiced their excitement about having Zinck join their community. Senior Associate Athletic Director Alexis Mastronardi spoke about the important role that Zinck will play on the team, calling Zinck the team’s “missing puzzle piece” and stating that in the limited time the team has known Zinck, she has already impacted the team. Toward the end of the ceremony, Zinck signed her statement of intent and was presented with her own Tufts lacrosse jersey: number 10. The team shared a video that they had made to welcome Zinck and played “Baby” (2010) by Justin Bieber — one of Zinck’s favorite songs. The ceremony signified that from here on out, Zinck will be included in all team functions and will attend games and scrimmages as a member of the team. While Zinck has limited experience with lacrosse, she is excited to learn more about the sport through her time with the team. Zinck’s father, Brian Zinck, explained that above all else, it was the team’s positive energy and kindness that attracted Zinck to the squad. Although most of the time that Zinck will spend with the team will be centered around lacrosse, Team IMPACT co-founder Jay Calnan explained that the goal of Team IMPACT is to forge a friendship that extends beyond the playing field. Not only will Zinck attend team functions, but the team will also plan fun activities to do with her. Calnan stated that the team’s presence will act as a form of support for Zinck. Regardless of what the season holds, the team feels fortunate to have Zinck on the team. Senior attacker Dakota Adamec echoed Schwartz’s sentiments.